May 2015 seems an awful long way away now, so much has happened. 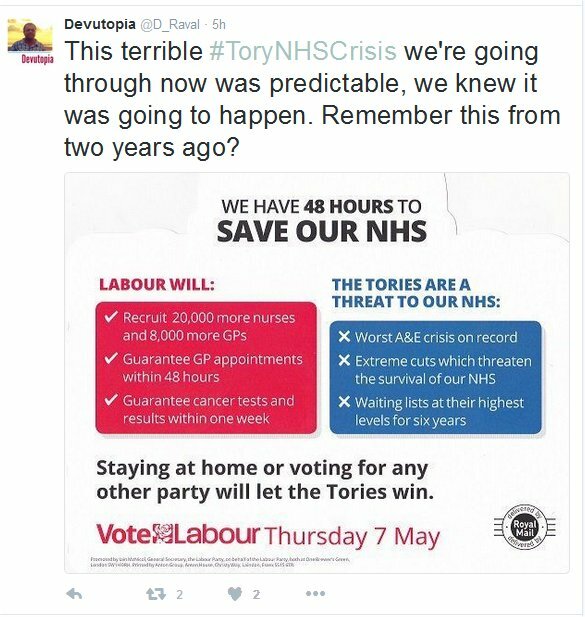 But I remember making a blog post near the General Election saying that, despite some misgivings on some of the policies put forward by the Labour Party that year (and set out on that terrible ‘headstone’…), I would be voting Labour with one main objective in mind – to Save Our NHS. I truly feared for our NHS under a Tory government and I just couldn’t understand why so many people couldn’t see this too. Well, my fears about the Tories have come true – they are deliberately dismantling our NHS and allowing it to fail. And I could just say ‘I told you so’ at this point, to all those Tory voters (or those whose votes split the left of centre vote) who are now complaining about not being able to see a GP or about ever longer waiting lists and waits at A&E. But that would be pointless and would solve nothing. Especially when the Labour Party, of late, has been struggling within itself rather than getting on and opposing the Tories and UKIP and exposing them for the parasites they are at every opportunity. Now I’m a member of the Labour Party (and have been since summer 2015) and I am looking to my party to hold this government to account – to show the public the Tory lies and to offer us all a solution that will not involve further privatisation (in fact, ideally the only way this will work is if the whole lot comes back completely into public ownership). And I’m looking for everyone in the Labour Party to get over their back stabbing and petty squabbles and to concentrate on doing something which is absolutely vital for all of us – that the Labour Party as a whole gets together and fights with everything its got to save our Free and public NHS. I know it won’t be easy. I would be a fool if I didn’t realise that the establishment in general will do everything it can to belittle and denigrate Labour now that it has a true democratic socialist as leader. But Labour brought us the NHS and Labour needs to be getting this across at every opportunity and demonstrating that they have real solutions and alternatives for Tory deliberate mismanagement. So, I guess this is not so much sad remembrance of why this is happening now and why we have a true Humanitarian #NHSCrisis, but a plea to everyone in the Labour Party – left, centre and right (and all bits in between) to come together for the sake of Our NHS. Because if Labour cannot do this then there really is no hope for any of us.